Situated in Bad Suderode, this hotel is within 6 mi (10 km) of Quedlinburg Castle, Quedlinburg Cathedral, and Klopstock Museum. St Nikolai Church and Teufelsmauer Nature Park are also within 6 mi (10 km). Situated in Bad Suderode, this spa hotel is within 6 mi (10 km) of Quedlinburg Castle, Quedlinburg Cathedral, and Klopstock Museum. St Nikolai Church and Teufelsmauer Nature Park are also within 6 mi (10 km). Situated in Bad Suderode, this hotel is within 6 mi (10 km) of Quedlinburg Cathedral, Teufelsmauer Nature Park, and Klopstock Museum. Quedlinburg Castle and Fachwerkmuseum Standerbau are also within 6 mi (10 km). 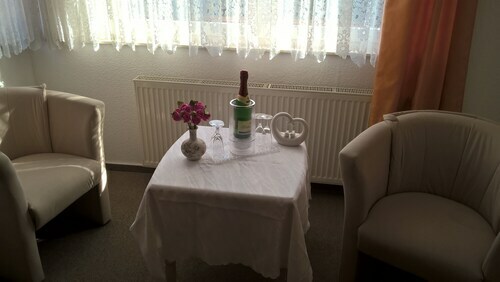 How Much is a Hotel Room in Bad Suderode? Hotels in Bad Suderode start at $63 per night. Prices and availability subject to change. Additional terms may apply. With 14 accommodation options in Bad Suderode, travelers here are able to find the best option. 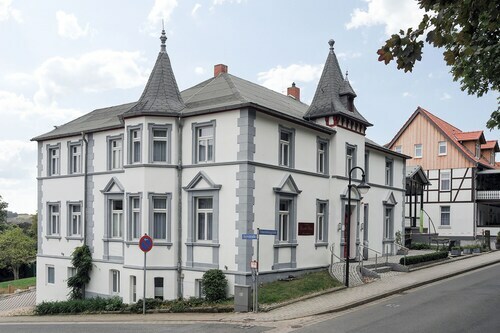 You can access about 14 accommodation options within a convenient drive of of Bad Suderode. Enjoy staying close to the center of Bad Suderode. Travelocity-listed lodgings located in the area include Kurhotel Bad Suderode and Schlosshotel Stecklenberg. The Best Western Hotel Schlossmuehle is around 4 miles (7 kilometers) from central Bad Suderode. 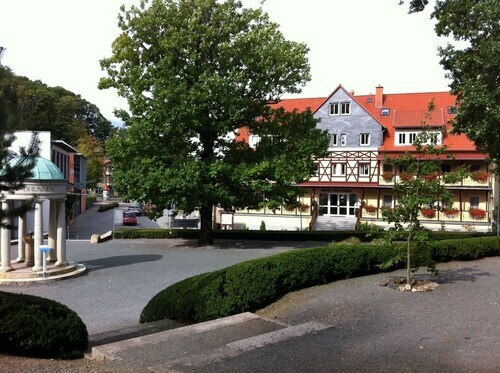 On the other hand, the Wyndham Garden Quedlinburg Stadtschloss is located 5 miles (8 kilometers) away. The Schlosshotel Blankenburg/Harz and the Parkhotel Unter den Linden are alternative options in Bad Suderode. The broader Saxony-Anhalt district is well worth visiting as well. Saxony-Anhalt is famous for its forests, rivers, streams and lakes. The most popular visitor places of interest are castles, old towns and fortresses. Popular things to do in this particular part of Germany include snowboarding, skiing and cross-country skiing. 30 miles (51 kilometers) to the northwest of Bad Suderode, you'll reach Goslar, where you can find Goslar Imperial Palace and Mines of Rammelsberg. 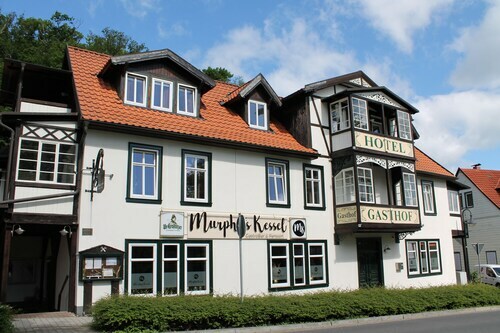 If you'd like to visit Goslar, check out the Altstadt Hotel Gosequell and RAMADA Hotel Baeren Goslar. 18 miles (29 kilometers) west of Bad Suderode, is Sorge, home to the Hotel Tannenpark and Landhausferienwohnungen Am Brockenblick. The Grenzlandschaft and Museum Sorge and Ring der Erinnerung are a couple of the frequented points of interest to visit should you visit Sorge. Just because you are having a getaway, who's to say that you can't feed your obsession for a day of sports. You'll find Red Bull Arena 60 miles (96 kilometers) to the southeast of Bad Suderode. For tourists who are thinking about booking a hotel nearby, book in the Steigenberger Grandhotel Handelshof Leipzig or Radisson Blu Hotel, Leipzig. When you're flying into or out of Erfurt Airport and hope to find a Travelocity-listed hotel in the area, check out Airport Hotel Erfurt or Hotel & Restaurant Park-Cafe ISA.